Discussion in 'The Lightweights' started by Kimura123, May 19, 2014. ...in 2007, Fedor vs Randy Couture, who wins? And if Fedor would have won, how many times would he have defended? Would he have beat Lesnar, Mir and Carwin? Also, what about JDS and Cain? who the hell knows how many times he wouldve defended it,but i think he wouldve destroyed couture. Couture's style wouldnt work with a guy like Fedor,and he wouldnt be able to eat Fedor's punches. Randy would have given him more of a run for his money in the cage, but I think Fedor would likely have won. If the fight was in a Ring, say it was Unified in Affliction or using Pride rules, Fedor would be much more of a favorite. He would have killed Randy. I'll never unserstand this idea that Couture would of been a hard fight for fedor. It would of been a beatdown. As for mir and lesnar, both would of got beat down. i think Randy circa 2007 was possibly the best Randy we've ever seen. Right then, after the Gonzaga fight, i would have picked Randy to beat any HW except maybe Fedor. And even then it would have damn close, and epic. I love randy, but he would not have a hope in hell vs fedor at that moment in time. Fedor beats randy, but would not of beat brock. I think mir would of handled him and I see carwin getting beat. Now come at me you dogs! Fedor would've beaten old Randy. Carwin would always have a chance with that massive hands but Fedor is quick. He would point out Carwin. I can see Brock beating Fedor, but Mir would not have any chance against Fedor. Mir cant take him down and the striking, speed, power, explosion etc are not even close. Mir is one of the easier hw matchups for Fedor. Mir would get pounded. But has an outside chance of a miracle sub. Car win would gas by round 2 and get submitted. Lesnar would wilt and give up under pressure and a couple of solider strikes. JDS would get pounded similar to the Cain fight. Cain stands the best chance of winning due to youth, explosiveness and durability. But of course this is all personal speculations where personal bias plays a role. What if Mike Tyson went MMA instead of Boxing? 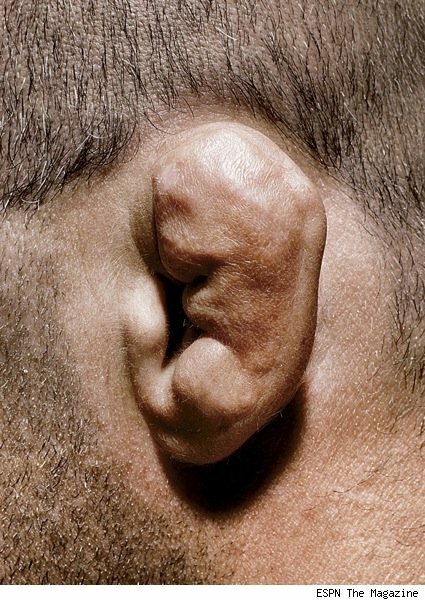 Randy's ear would get bitten off. Fedor would have beat Randy and held the belt till he ran into JDS, Werdum, Cormier, Cain, all of who would give him tough fights and possibly beat him-- especially Cain. Brock beating fedor? Are you guys insane? Brock isnt even as good a grappler as fedor. Putting brock, a guy who cant take a punch, in with one of the hardest hitters in mma history, who also happens to be lightning quick, is only gonna end one way. At no stage in brocks career was he a top 3 hw, and possibly not even top 5.